Born in Manchester, New Hampshire, Samuel Cole moved with his family to the town of Berlin, where Samuel’s father joined his uncle and two cousins working at the Brown Company’s pulp mill located along the bank of the Androscoggin River. Samuel’s father and uncle leased land across the border in western Maine, where they built a cabin located beside Little Otter Brook and within view of the Big Otter River. The two men spent weekends and holidays hunting partridge and snowshoe hare that grazed outside the door of their camp, as well as deer and moose that roamed freely throughout the vast conifer forest that is known as Maine’s North Woods. They trapped beaver, otter, and muskrat up and down the bigger river, all of which were abundant at the time, and fished for brook trout and landlocked salmon that came willingly to their flies. During August of his tenth year, Samuel convinced his father to allow him to remain at the cabin during the week while the older men returned to their jobs at the mill. The young boy would wake early each morning, collect his hand-me-down fly rod—a whippy, Montague sunbeam model—and a fleece-lined wallet that contained the streamers he’d tied over the winter. Before heading out to the stream, he’d throw an apple into a paper bag along with a baloney sandwich. Wading wet, he cast his flies through the big river’s unrestrained rapids, across its sunlit riffles and into its dark pools, the deepest of which contained trout as large as pike. By the end of that summer, he’d explored as far up the river as Grant’s Dam. Back then, loggers used the dam, a modest wooden structure, to raise the level of the current each spring to float timber down to Granger Lake. He also fished Little Otter Brook, the thin ribbon of water that slipped through the forested hills and flowed beside the camp, where it entered the wider river within sight of the open porch attached to the Cole’s cabin. Samuel Cole never stopped fishing the Big Otter River. Although he learned to be on his guard, the river’s bruising current swept him off his feet a number of times over the course of the years, resulting mostly in a dunking, but once, he’d twisted his knee causing him to limp across the mill floor for the following three weeks. Another time, Samuel developed a black eye and lost two teeth when he bashed his face against a submerged boulder. The pools separated by the river’s rapids were mysterious affairs. Deep, dark, and wide, they held the largest fish. It was not uncommon for Samuel to return to camp with a brace of eighteen-inch brook trout. Besides trout, there were landlocked salmon that would fling themselves above the surface or dance upon their tails upon feeling the prick of steel. As he grew older, Samuel began releasing most of his catch, but always kept a few smaller trout for the breakfast skillet. Samuel also found that he now preferred fishing the brook rather than the river with its heavy water and big fish. Sheltered by spruce and balsam that grew tightly along the banks of the smaller stream, the narrow slip of water fell downward over a course of three miles from its source, Blue Moon Pond, a small body of water located not far from the Canadian border. Even during high summer, shade cast by the conifers’ overhanging branches cooled the little plunge pools that held finger-sized trout. Bigger pools formed by fallen trees and larger boulders were never more than a few feet deep, but could be counted upon to hold palm-sized fish willing to rise to a well-placed fly, perhaps an Adams or maybe an elk-hair caddis. Although he gave it much thought over the years, Sam was unable to come up with a reasonable explanation as to why there were no salmon in the brook. The pond held trout measuring between twelve and sometimes fourteen inches. One evening, he hiked the three miles, failing to stop at any of the lower pools, hoping to reach the backwoods impoundment before dusk. Seated on a moss-covered boulder, Samuel drank from a thermos of tea while eating a cheese sandwich he’d carried with him. Dimples appeared upon the pond’s surface as the light began to fade. Samuel knew he had perhaps forty-five minutes of fishing before it would be too dark to see his fly. He’d released three plump brookies when the maw of a fish broke the surface. Sam had never seen a trout so large. After knotting a Hornberg to his tippet, he cast toward the ripples that were quickly dissipating. No sooner did the big bushy fly plop upon the water than the maw reappeared. When Samuel pulled back on his rod, the trout turned, his line springing back in a helpless tangle around his legs. The flashlight he carried barely illuminated the exposed roots and jagged rocks that caused him to stumble more than a few times as he made the long hike back to the cabin under a moonless sky. Although he never again was able to raise the phantom fish, for many years its memory drew him back to the tannin-stained pond. During summer, when the air was heavy with humidity, the scent of balsam swept down out of the forest. Kingfishers chattered their displeasure over Samuel’s presence while great blue herons rose from the shadows upon his arrival. 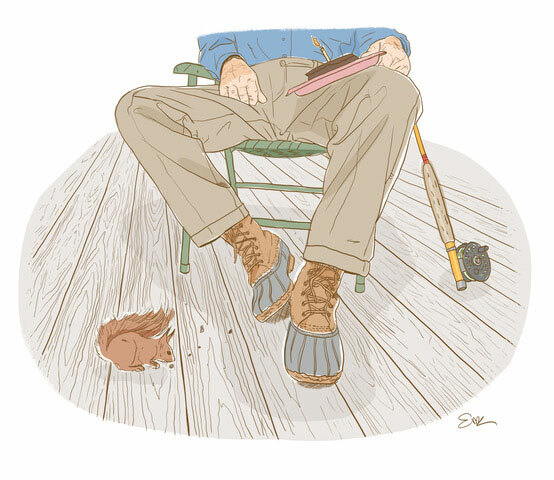 Over the years, he’d come upon otters and beavers along the brook’s shoreline, although by no means as abundant as when his father and uncle first built their cabin. Once, while Samuel was seated on a fallen log, a trio of immature weasels weaved around his legs. On another occasion, he looked up to find a bobcat staring down at him from the top of a towering boulder. Red squirrels and chipmunks were his constant companions. Deer sipped from the cool water of the little stream. Moose crashed through the tightly packed branches of the surrounding forest, emerging beside the brook, only to turn tail upon seeing the angler. One time, Samuel interrupted a black bear and her three cubs. The sow was seated in the far end of the pond with water up to her neck while the three little ones roughhoused in the high grass. When his wife of fifty-six years passed away, Samuel moved in with his daughter and her family. He rarely saw his son-in-law, who worked odd hours at the state correctional facility located on Berlin’s East Milan Road. When not working, the younger man could be found at The Fishing Hole, a tavern off of Green Square. Samuel’s daughter worked six days a week at Berlin’s post office. It appeared to the Samuel, that when not in school, his grandson spent all his time playing videos games. Samuel had continued to drive out to the cabin, fishing the brook and on occasion the river. One afternoon, while swinging a soft-hackled wet fly through Cooper’s Run, he hooked a twenty-four-inch salmon. The following year, while again fishing the big river, Samuel hooked two trout on successive casts with a streamer of his own design. He estimated their respective lengths to be twenty and twenty-two inches. By his eighty-first year, Samuel could no longer depend upon his legs to wade the big river. For a number of seasons, he’d continued to hike up to Blue Moon Pond, but by eighty-five, Samuel had made peace with the idea that he’d never again fish its waters. The year he turned eighty-six, the aging angler was beginning to lose his eyesight. Rather than concern his daughter, Samuel kept the fact to himself. Only after it was too late did he discover that the macular degeneration had progressed to the point where it was irreversible. By eighty-nine, the old man had gone blind. In the spring of the following year, he told his daughter that he was moving into the cabin. Although she protested, there was little she could say to stop him. The cabin had remained sparsely furnished, which made it easier for Samuel to navigate. There was a single bureau on a wall of the bedroom, with a nightstand to the left of the bed. A hook on the inside of the door held his wide-brimmed hat. A Boston Red Sox cap, its dark blue brim stained with grease and oil, hung on another hook, his rain jacket hanging from a third. The bedroom door opened into a large room. Against one wall of the room was an old couch that years earlier Samuel had managed to carry into the cabin after tying it to the top of the Ford Station Wagon he’d purchased during the years the mill had been going strong. In a corner of the room was the chair Samuel had once used when rocking his infant daughter to sleep, later bringing it with him when he moved into his daughter’s house. Samuel could not recall how an easy chair with a musty cushion found its way into the cabin, but for as long as he could remember it had squatted in the other corner of the room beside an ancient Franklin woodstove. In the middle of the floor were four chairs pushed under the sides of an oval table where the elderly man took his meals. Almost as old as Samuel, a propane refrigerator stood next to a stove, which was also fueled by propane. A countertop with shelves above and below separated the stove from a sink. A few years after his father passed away, Samuel had installed a pump to draw water from the river and a generator to power the pump. About the same time, he added a bathroom with a toilet and standup shower. His daughter drove out once every few weeks to provide Samuel with food, mostly canned goods that he could heat up, and sandwich meats, cheese, and boxes of cereal. It took a while, but Samuel adjusted to his blindness. He counted the number of steps from the bedroom to the toilet and from the table to the couch. He was able to negotiate short distances around the outside of the cabin, carrying firewood from the lean-to to the woodstove and filling a birdfeeder that hung from a wire on the branch of an old apple tree his uncle had planted while Samuel was still a boy. With the use of a cane he’d whittled out of a maple branch, Samuel would at times walk down the well-worn path to where Little Otter Brook entered the larger river. There, he’d sit upon a flat boulder facing the rush of larger water. But it was the brook that brought him the most pleasure. Only a few feet from the cabin, the sound of its current bouncing over a rock-and-cobble bottom was the canvas upon which all of the forest’s other sounds were painted. After so many years, Samuel had come to know the big river and tiny stream as well as a man can know such things. For this reason, he was able to spend his afternoons tramping alongside their banks without leaving his chair. He chuckled when palm-sized trout rose through the brook’s countless plunge pools to grab his elk hair caddis and whooped at salmon that stripped line off his reel as they rose through the surface of Springer’s Eddy or Wheeler’s Pool to dance a jig—all while seated on the cabin’s porch. Samuel’s daughter drove out to see him a few days before his ninety-second birthday. She spent longer than usual fussing about the cabin. While she arranged provisions on the kitchen shelves, they chatted about old times. Afterward, she brewed a pot of tea. They celebrated his birthday by eating slices of a cake with chocolate icing that she bought at the Save-A-Lot on her drive out of Berlin. It was a warm September afternoon and the smell of balsam was especially strong as they sat on the porch. Although the songbirds chirped and sang, the chipmunks and red squirrels kept their distance while his daughter was present. It was late afternoon by the time she pulled away from the cabin. Leaning back in the wicker chair, Samuel could hear a red squirrel that had scurried up the porch steps and was scavenging bits of cake that had fallen from his paper plate. Although he could not see, Samuel knew the sun was setting earlier with each passing evening. Still seated on the porch his father and uncle had built, Samuel Cole knew it was time he began the long hike up to Blue Moon Pond. With a long slow sigh, he closed his sightless eyes. A moment later, Samuel was working his way up the narrow stream. He found that he carried the old Montague in one hand and a bag with an apple and baloney sandwich in the other. Maybe, he thought, just maybe, that big trout would be waiting for him.